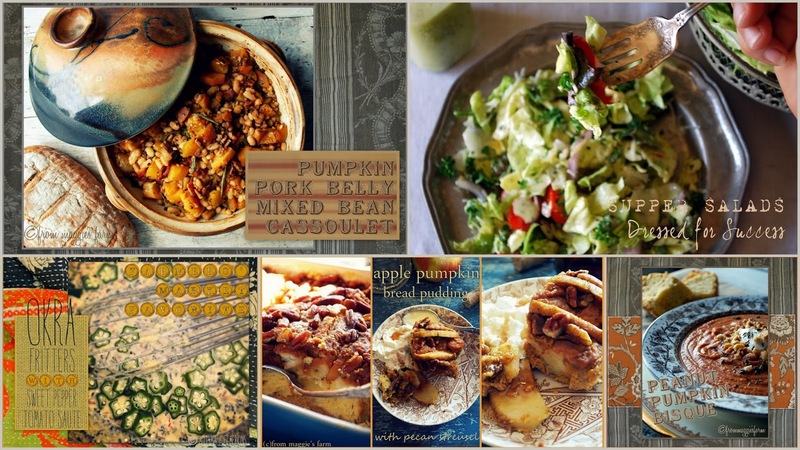 Do you need a little inspiration to continue to eat seasonally at home? 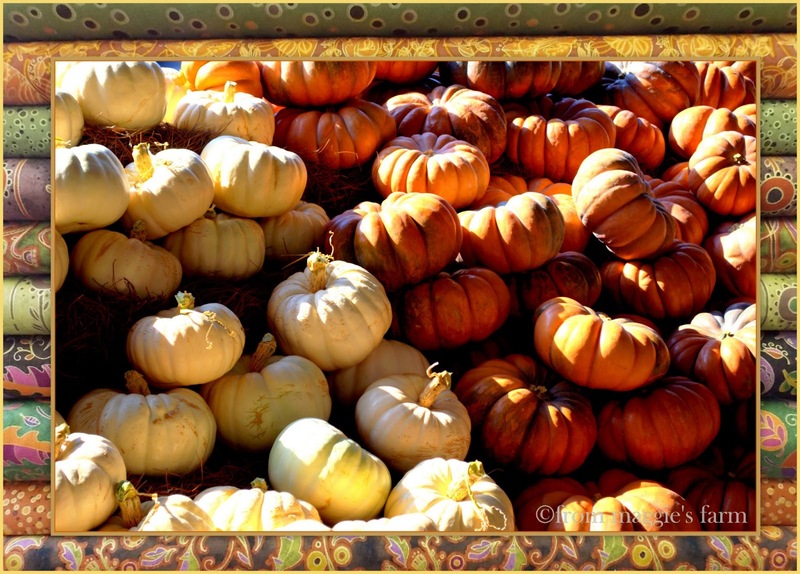 If you find yourself in Austin this weekend, or any weekend for that matter, check out the Texas Farmers' Markets calendar of events. The Season's Best series, with Market Chef Maggie Perkins (MOI!) runs twice a month at TFM Lakeline and TFM Mueller. This week, I'll be creating eats from the best the market, and the season, has to offer. Additional appearance dates for the year include November 7 and 21, December 5 and 19 at TFM Lakeline, and November 8 and 22, December 6 and 20 at TFM Mueller. And as the evenings cool, and those first cold snaps arrive, be prepared to face the seasons ahead with your best GUMBO GAME. 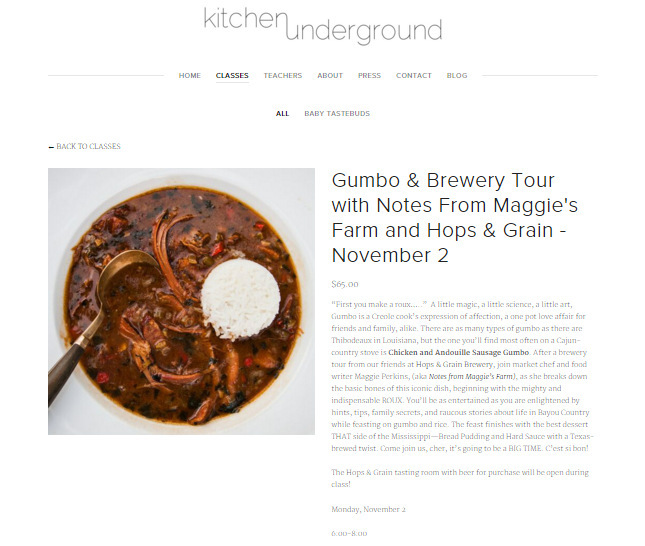 I'm delighted to be joining Kitchen Underground and Hops & Grain Brewery in Austin for Beer and Gumbo, a tour through the brewery and a gumbo-making class, culminating in a dinner of Chicken and Andouille Gumbo, and Bread Pudding with Hard Sauce (which takes a beer brewery twist!). Seating is limited and on a first-come basis so hop on that, y'all! Class will take place Monday, November 2, and tickets can be purchased right here. C'est si bon, cher! Last but not least, I am honored to have my recipes featured in local Georgetown View this month. Hard copies are available at newsstands around Georgetown, like the Visitor's Center and the Chamber of Commerce, however if you are not local, you can also see a version of the article online. I'll also share more about this neat experience in an upcoming blogpost. I'm happy to say I'll be featured in December with ideas for easy, yet elegant holiday entertaining, and again early next year, for Mardi Gras favorites. I'll keep you posted! Well, we got taken to school. Bourbon Booze School! A bourbon tasting and education session hosted at Icenhauer's, located in the historic Rainey Street District of Austin. I knew so little about bourbon-- I wasn't even sure if bourbon was a whisky, or whisky a bourbon. I was bourbon-dumb, for certain, but bartender Stuart Thompson brought me, and my peers, up to speed this week, giving an intimate group of bloggers and industry folks the lowdown about the country's favorite liquor. Bourbon is a whiskey made with at least 51% corn, aged in never-used white oak barrels, the interior of which is charred before filling. It has zero flavor or color additives: just corn, water, wheat or rye, and malt, and must be between 80 and 160 proof. Although the lion's share of whisky is made in the state of Kentucky-- 95%, it can be produced in any of the United States to be called bourbon. Bourbon barrels can be used to age the liquor only once-- used barrels are utilized in the aging of other liquors. Bourbon is America’s only native spirit, as declared by Congress in 1964. Thompson mixed 5 seasonal bourbon cocktails for us, using Bulleit brand bourbon, exclusively, frequently infused in-house with various herbs, fruits, spices, and nuts. Before #BourbonBoozeSchool, I can't say I was much of an informed bourbon drinker, but after learning more, tasting some premium liquor, and enjoying creative, lively cocktails, I'm on the bus! Why don't you try your hand at one? Combine all ingredients together in a shaker with ice. Shake vigorously and strain into coupe glass. Enjoy! Thank you for the invitation to #BourbonBoozeSchool, Icenhauer's, and the education and refreshment, bartender Stuart Thompson. Can't wait to be back! and enjoy cocktails, free of charge. Update: This article has been updated to include additional to-do items for the fall garden, including Farmers' Almanac weather forecasts and moon phases, October 2015. Fertilize existing beds of iris with well-rotted manure or balanced fertilizer. Reduce houseplant fertilizer by 1/2 for winter. Divide and transplant crowded perennials. Dig and store caladium bulbs. Dust with fungicide. Mulch gingers and other tropicals that overwinter outdoors to retain warmth and moisture and to control weeds. Falling leaves make autumn a good time to start a compost pile. Shred (or mow) leaves to speed decomposition. Turn compost pile periodically and keep it moist. Full Hunter’s Moon or Full Harvest Moon – October: This full Moon is often referred to as the Full Hunter’s Moon, Blood Moon, or Sanguine Moon. Many moons ago, Native Americans named this bright moon for obvious reasons. The leaves are falling from trees, the deer are fattened, and it’s time to begin storing up meat for the long winter ahead. Because the fields were traditionally reaped in late September or early October, hunters could easily see fox and other animals that come out to glean from the fallen grains. Probably because of the threat of winter looming close, the Hunter’s Moon is generally accorded with special honor, historically serving as an important feast day in both Western Europe and among many Native American tribes. Read more about moon phases and full moon folklore at the Farmers Almanac. 13th-15th Start seedbeds. Favorable days for planting above-ground crops, and leafy vegetables such as lettuce, cabbage, kale, and celery where climate is suitable.16th-17th Do clearing and plowing, but no planting.18th-19th Plant tomatoes, peas, beans, and other above-ground crops, indoors in the North and outdoors in lower South.20th-22nd Poor planting days. Kill poison ivy, weeds, clear land, but no planting.23rd-24th Extra good for vine crops. Favorable days for planting aboveground crops where climate is suitable.25th-26th Barren days, do no planting.27th-28th Good days for transplanting. Good days for planting beets, onions, turnips, and other hardy root crops where climate is suitable.29th-30th Poor days for planting, seeds tend to rot in ground.31st Start seedbeds and flower gardens. Best planting day for fall potatoes, turnips, onions, carrots, beets, and other root crops where climate is suitable. 12th-15th Milder weather, then showers. 16th-19th Mostly fair. 20th-23rd Unsettled for Rockies, Plains. 24th-27th Clearing and colder. 28th-31st Wet weather, followed by clearing skies. For forecasts for additional U.S. and Canada regions, consult the Farmers Almanac. Fertilize with 3-1-2 ratio fertilizer. In newly-plugged lawns, sow 8 lbs. of rye grass per 1000 sq. ft. to help hold soil. The seed grass will make a bright green carpet until spring, when hot weather will kill rye. Not recommended for established lawns. Mow every 5-7 days and leave the clippings on the lawn. Check for cabbage loopers in the garden; spray with Bacillus thuringiensis (Bt). Make second treatment for brown patch on lawns with a history of the disease. Prune shrubs as needed, but save major pruning for the winter. Remove dead and damaged wood from shrubs and trees. Make cuttings of tender plants before frost. Dig sweet potatoes before first frost. 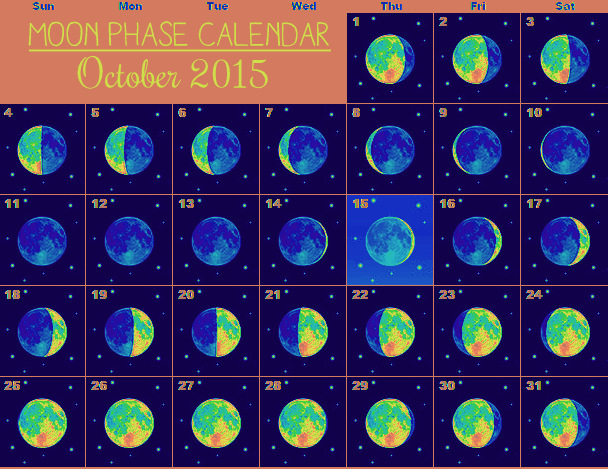 Weather forecast and moon phase calendar courtesy of Farmers' Almanac. I've said it before, and I'll say it again. I used to hate vegetables. For the most part, that is. As a general rule, I found vegetables to be the also-rans of my dinner plate-- the food I had to eat to get to the food I wanted to eat: MEAT. I was steadfast in my assertion that vegetables were bland and boring. It was only when I began to explore the vast varieties of unfamiliar vegetables that I learned how wrong I was. Given some idea of how to prepare them, I began to incorporate more and more vegetables into my diet. 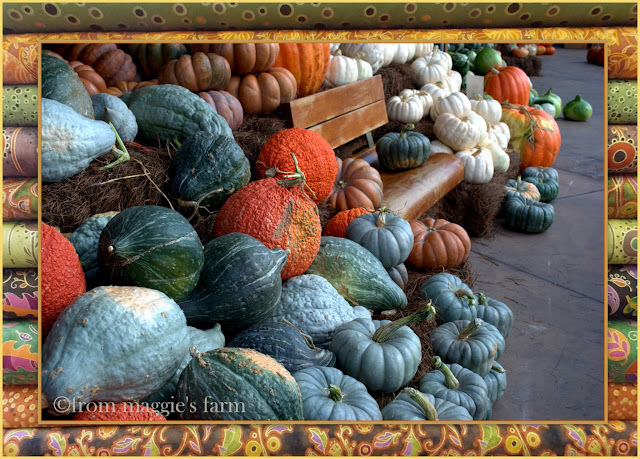 So I welcome the challenge, as market chef for Texas Farmers' Markets, to introduce new vegetables each season, and offer new ways to prepare them. 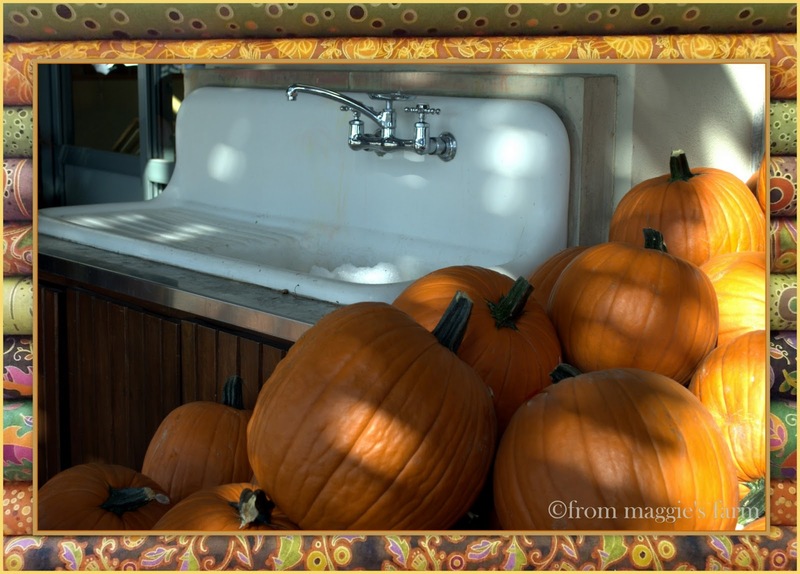 Each weekend visit, I look for opportunities to share the freshest favorites, as well as the more obscure vegetables that grow well in Texas, but may not be as well known. Such was the case last weekend, as I watched market-goers pass beautiful purple bulbs of kohlrabi by, one after another. 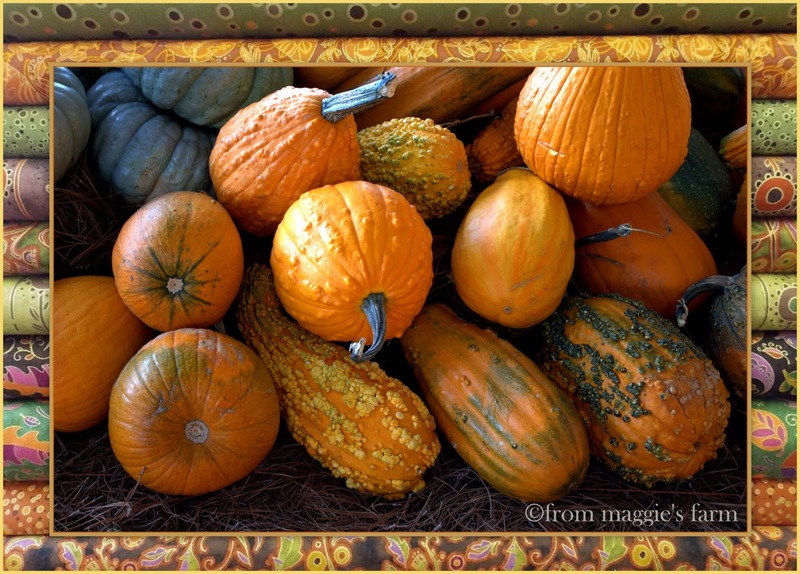 Customers ooed and ahhd over plump squash and baby pumpkins, but mostly looked quizzically, then passed by, this surprisingly versatile cruciferous vegetable. Kohlrabi is a stout, round tuberous vegetable that grows at ground level. The edible bulb is white, green, or purple, and all 3 have the same creamy white interior. Kohlrabi is a member of the cruciferous family of vegetables that includes cabbage, broccoli, cauliflower, kale, collard greens, and brussels sprouts. It has a mildly peppery finish, similar to that of cauliflower, but boasts a hint of sweetness, too. Eaten raw or cooked, Kohlrabi is an excellent source of vitamin c (132% RDA per 1 cup serving), and fiber (19% RDA), and comes in at just 37 calories. Choose bulbs that are about the size of a tennis ball, and peel the outer skin before eating. When allowed to grow larger, bulbs become woody and inedible. Don't forget the leaves, too! Kohlrabi leaves are packed with nutrients just as their sibling kale and collard greens. I paired kohlrabi with its 'grow-together, go-together' mates: pear, radish, baby super greens, and cool season mint, and complemented the sweet ingredients with a creamy goat cheese dressing, including honey and tarragon vinegar, recipe provided below. Trim greens from kohlrabi (reserve for using as you would any green--add shredded finely to slaw or salad, cook with other greens, add to smoothies and stocks for added nutrients, etc...). With a sharp paring knife, remove tough outer peel, slice thinly, then stack slices and cut into “matchsticks". Remove greens from radishes, again reserving as suggested above. With a sharp paring knife or mandoline, slice horizontally into razor-thin slices. Remove mint leaves from stems. Chop finely. Cut pears in half, vertically. Remove core. With peeling on, slice into razor-thin half-moons. Toss kohlrabi, radishes, mint and pears in a large bowl with Creamy Honey Tarragon Chevre Dressing. Mound slaw on a platter lined with baby super greens. Serve. To 2T vinegar in a large mixing bowl, vigorously whisk in honey, then oil, adding in a steady, slow stream. Add softened chevre, whisking until well blended.